Matheran is a popular weekend hill station, perhaps the nearest among all the tourist hills from Mumbai. The geographical and other details of the place is easily available elsewhere online so here we would talk business! What we mean is we present you a practical guide to this awesome place based on our own experience. (We visited Matheran in July 2015). Whether you a backpacker, a family tourist or a group of friends, this guide will definitely help you while you're there! Why and What is it famous for!? The red carpet! Is it? Not really. Haha. We are talking about the red sands and soil. The post-monsoon lush green flora and fauna(read monkeys primarily?)! 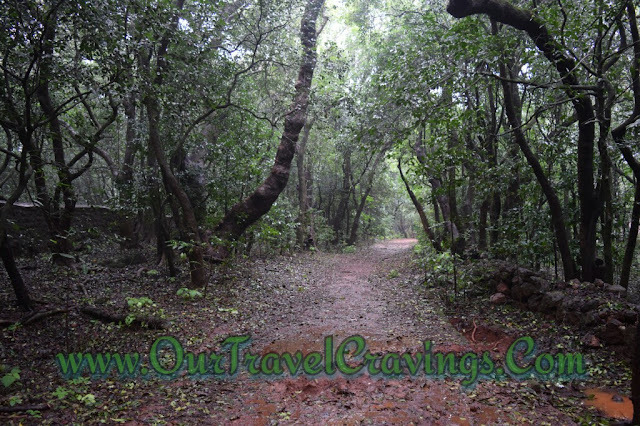 Depending on the season, your trip to Matheran may turn from ordinary to extraordinary to incredible! 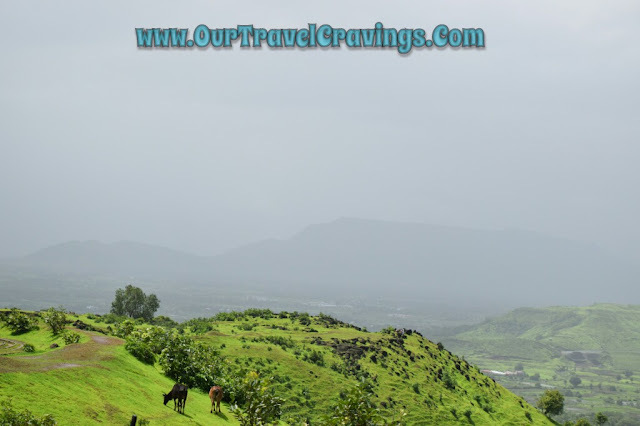 The best time to visit is perhaps post-monsoon or during monsoon. We visited mid-monsoon and it got incredibly exciting with the rains playing hide and seek throughout the day, the clouds making almost hourly rounds over our cottage (The Westend Hotel - an awesome place to stay in Matheran and which we have reviewed here). Thus, July to October for the greenery and November to February for the cool weather - are ideal times to visit this place. The toy train services from Neral to Matheran are usually closed from July to September due to bad weather so consider that too. However, here's something I didn't find anywhere else during our reasearch before the trip - the toy train functions between the stations of Matheran and Dasturi car park (Entrance of Matheran) even during monsoon. This is a short (around 20 min) and enjoyable ride. Both these stations are located after the climb to the hill. Read further down on how to reach to know exactly what we are talking about..
Matheran is only about an hour from Mumbai. One does in fact needs no guidance on how to reach Mumbai, does one? Lol still here's a small tip - flights to Mumbai are quite affordable because of it being a popular hub of flights flying across north and south India. And during the months of Indian monsoon i.e July to September , frequent flight offers are spotted. Grab one of these offers and take a cheap flight to Mumbai if travelling by train for you is too ordinary! (We were three of us and got a good deal from Ahmedabad - 3 return tickets for just around 7000 INR) So, keeping long things short, taking the flight to Mumbai is of course an option if your pockets are slightly on the heavier side. 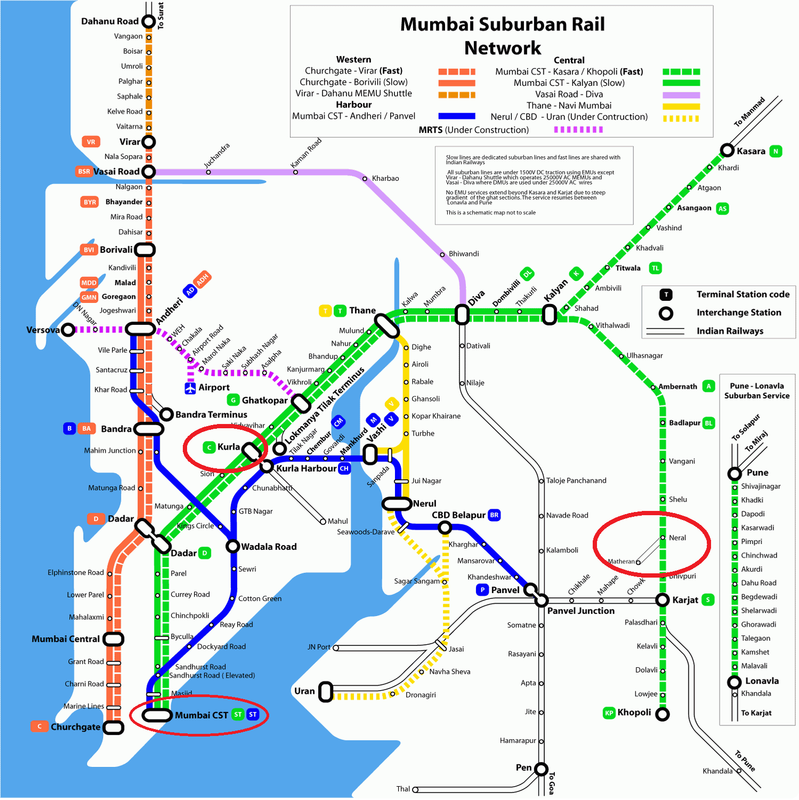 From Mumbai, you have the option to catch one of the sub urban trains that take you to Neral. The following image (with highlighted red circles) explains you exactly which route to take to reach Neral. Mind you, Neral is a stoppage only for local trains so dont board the express trains or else you will have to reach Karjat and backtrack from there. 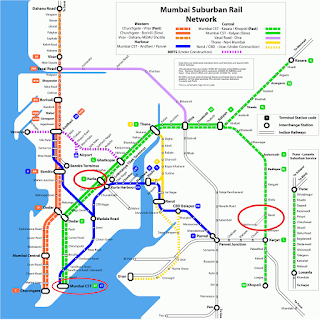 You can take either the Kurla route or the Mumbai CST route trains depending on where you're coming from. If you are coming by air to Mumbai then Kurla is the nearest station. Travel by train only if you are not having substantial luggage or if you are 100% sure that you can manage the luggage and of course yourself in the rush. Mumbai suburban trains have heavy rush during peak hours. The tickets are dirt cheap in general class and taking first class tickets are not really that worth it. This is the most economical option. 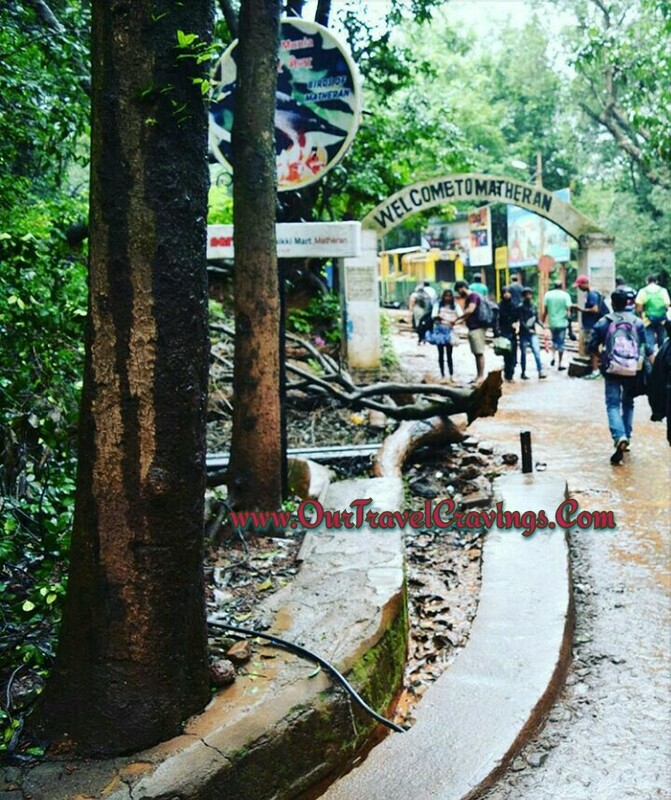 Location guide of Matheran, Neral and Karjat stations and how to reach there! If not by train, you can hit the road. The distance is approximately 110 kilometers from Mumbai. Take Mumbai-Pune Highway(NH-4) upto Chowk Village and turn to Karjat road. From Karjat, the same road goes to Dasturi Naka, i.e. entrance of Matheran via Neral. Get on to the Mumbai Pune Expressway at Panvel (Near McDonalds). Get onto the expressway to avoid the congested road through Panvel. Take the first exit (Shedung/Khopoli Exit) that comes less than 5 minutes after you get onto the expressway at McDonalds. (Here you will need to Pay a Toll at the toll-booth for using the expressway). This exit gets you back onto the Old Mumbai-Pune Road. Follow directions to proceed towards Pune. Once again you will have to pay a toll for using the old Bombay Pune Road. (Toll in both places is about Rs.25 each). 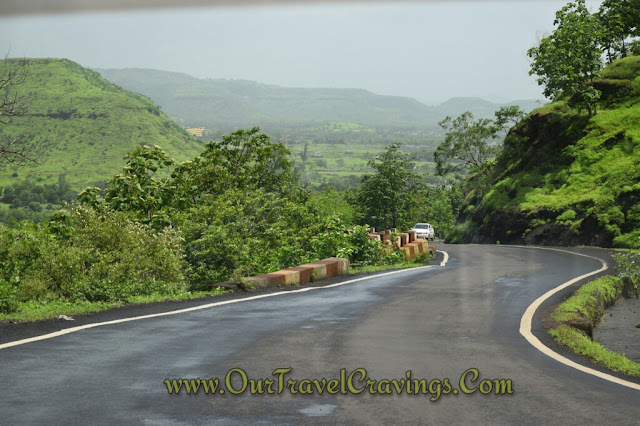 Follow the old Mumbai-Pune road for approximately 10 km. This will bring you to a crossing where a big green sign asks you to turn left for Karjat/Matheran. (Do not miss this crossing as otherwise you will end up in Khopoli. There is a large statue of Hindu god Shiva on right side of the old Mumbai-Pune Highway which can be seen from a long distance. The left turn about 50 metres before the statue). 9 km After turning left you reach another crossing called Charphata Karjat where you need to turn left towards Neral. 11 km After turning left, you will reach the bottom of the Matheran Hill ghat road. Use the Pune-Mumbai expressway and get off the Pune-Mumbai Expressway at the Khopoli exit after passing Lonavla/Khandala and get onto the old Pune-Mumbai road. Turn right after around 18 kms into Chouk town. Follow the signs from then on. One can also exit Pune-Mumbai NH4 at Haal Phata near Khopoli to enter SH 35 which will take you straight to the bottom of Matheran Ghat Road. 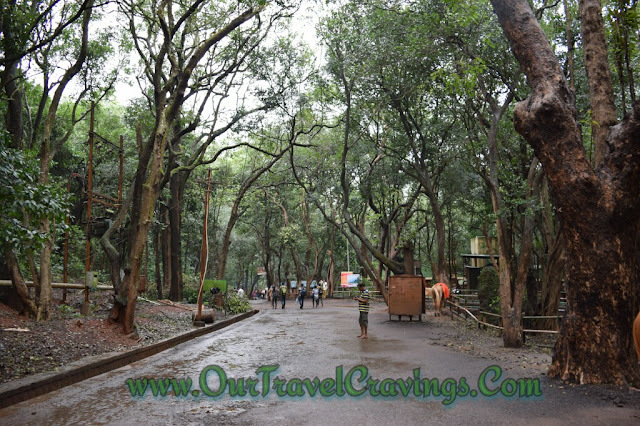 Here you will find the taxi stand from where you they take you through a climb of about 7 kilometres to Dasturi car park which is the entrance of Matheran. The climb is having lots of V turns without borders, so in case you are coming by your own car, it is advisable to get a local driver for the climb. They are easily available. If you have hired a cab, we would advise you to board off the cab and take the shared taxi from the taxi stand (Around 70rs per pax - fixed rate). The drivers are impeccably reliable so you can enjoy the scenery instead of worrying about the slightly dangerous roads. In our case, from airport we reached Kurla station via cab and took the suburban local train from Kurla to Neral (and thus saved approx.around 2000-3000 bucks on taxi). From Neral taxi stand we took the shared taxi to Dasturi car park. It was a short but adventurous climb of around 20 minutes and we reached the Dasturi Car park, This is the last point till which vehicles are allowed. There is a small entry fee to enter Matheran town. Here are some breathtaking nature pictures that we captured on our way above.